Should you keep the egr cooler or install an EGR Delete? In 2003 Ford introduced the 6.0 Powerstroke to the world. This is the same engine that International calls the VT365. This engine has received a really bad reputation in the diesel world due to reliability issues. We will tackle one of the problem areas here today, the egr system. 1. What is the EGR system and why do I need it? One of the most frequently asked questions we receive is what is the EGR system and why do I need it? We don’t have to go into long technical descriptions here. EGR stands for Exhaust Gas Recirculation. To meet certain emissions standards, it is necessary to reintroduce exhaust gases into the intake air in order to bring certain elements in the exhaust within levels set for that year of truck. Of course you wouldn’t want to dump hot exhaust gas directly into the intake manifold, so that is why there is an egr cooler. The cooler has engine coolant running through it and looks very much like a regular radiator or heater core. The exhaust gas passes through this small radiator and lowers the exhaust gas to a temperature that it is able to be introduced into the intake system at. 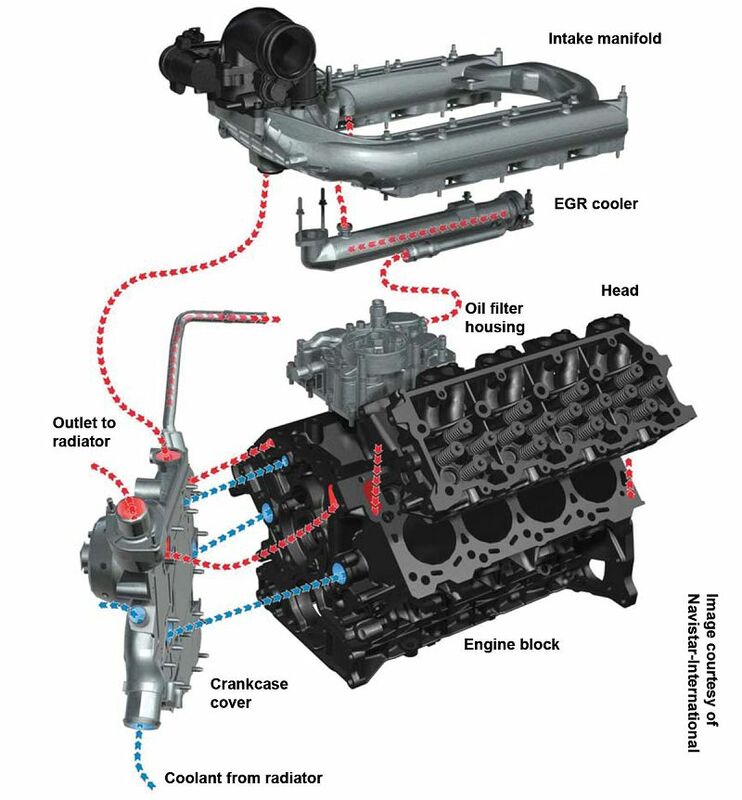 On the 6.0 Powerstroke engine, it is an extremely simple system consisting only of a cooler and a valve. When the engine’s computer decides the egr valve should open under certain conditions, the exhaust gas is let out of the cooler and into the intake manifold. And here we have the first hint of a problem; the exhaust gas is always in the egr cooler. 2. What goes wrong with this system and how can it hurt my engine? The big problem here is heat. It is possible for a completely stock engine to produce exhaust gas temperatures well in excess of 1000 degrees. So imagine taking 1000-1500 degree air and constantly running it through your heater core day after day. How long do you think it would last? Next, put that heater core in an enclosed box that has to endure not only the high temperatures, but also 10-50 psi of exhaust backpressure that is built before the turbo between it and the exhaust manifold. Even though the cooler is made out of materials that are meant for higher temperatures, it is not a matter of if, but when your cooler will fail. Best case scenario is that the cooler just leaks a little coolant into the exhaust system and it passes out the exhaust and you just notice some coolant loss. Worst case scenario, exhaust pressure is able to enter a break in the cooler and enter the coolant system which only runs at 12 or so psi max. The high pressure will ruin head gaskets and oil coolers. They simply weren’t designed to withstand that much pressure in the coolant system. Also, the coolant system cannot keep the truck cool with that much pressure in the system. This is why you will hear about or may have experienced coolant puking out of the filler cap on the degas bottle after pulling a load up a long hill. The cap is made to bleed off pressure above 12-14 psi. The increased coolant temp and extra pressure being pushed in from the exhaust will push coolant right out the cap. We have a truck in the shop right now with a blown egr cooler and head gasket. The pressure in the coolant system had gotten so high that it blew one of the hoses right off the coolant bottle. This truck was a bone stock work truck. This blown cooler problem only gets worse when you put a programmer on the truck that raises exhaust gas temperatures several hundred degrees. If you put your programmer on the highest setting, hook to a heavy trailer, and then go tugging up a long grade, I suggest you put your mechanic on speed dial. You will need his services soon. As if that all isn't bad enough, the egr cooler will break down the Gold coolant that is installed in the truck from the factory. The high exhaust temperatures in the egr cooler will cause some elements of the coolant to drop out and turn into a sludge material that will cause all sorts of problems in the coolant system. The sludge will start clogging up the oil cooler and will restrict flow through it. The next place the coolant heads after the oil cooler is the egr cooler. As the oil cooler becomes more and more restricted, the less flow through the egr cooler there is. This why you sometimes hear about people blowing egr coolers one after another in very short periods of time. The mechanic replaced the cooler but did not check the oil cooler to make sure it wasn't clogged. We suggest changing the oil cooler when doing an egr cooler replacement or delete if your vehicle has over 100K miles. The test is to monitor oil temperature and coolant temperature with a scan tool. The two temperatures should never be more than 15 degrees apart under extended full load conditions. The other problem with the system is that the egr valve constantly gets coked up with exhaust soot. The dirty exhaust gas passing by it deposits soot on the valve surfaces. Sooner or later the valve will get enough soot on it that it can’t close and operate normally. Exhaust gas is constantly pouring into the intake manifold now. This condition causes severe drivability issues, poor fuel economy, and low power. If you have owned a 6.0 Powerstroke for very long, you have no doubt replaced, cleaned, or had your egr valve checked because of this problem. 3. What can we do to fix this problem? There are a couple of fixes to this problem. The first and most obvious is to simply remove the cooler. Unfortunately, that would be against the law. 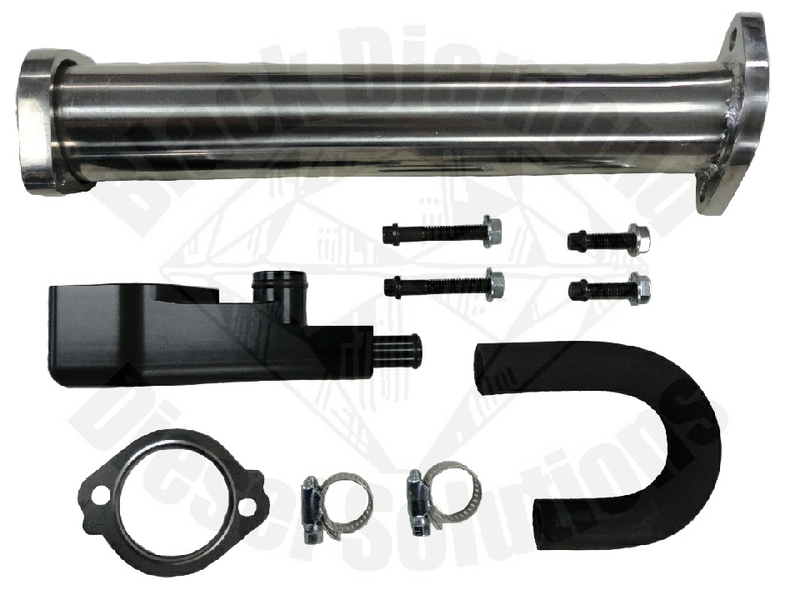 We do sell an 6.0 Powerstroke egr delete kit to do just that if you are going to use your truck for off road only. This kit completely removes the cooler from the truck. There is a line that bypasses the coolant from where it comes out of the oil cooler directly to where it once came out of the egr cooler into the intake manifold. There is also a pipe that replaces the factory up-pipe between the exhaust manifold and the turbo. Some years have a scoop in the factory pipe to help direct exhaust gas into the cooler. Since the cooler isn’t going to be there anymore, we need to replace that pipe with one that doesn’t have the flange for the cooler nor the scoop. There is some debate on how much difference in performance replacing the up-pipe actually makes, but I personally would just like the stupid scoop out of there if it was my truck. Also, we are removing one more place to have an exhaust leak by not leaving the factory cooler flange with some sort of block off in it. Also the solid pipe removes a factory flex joint that isn’t needed anymore. Installing the full kit with the solid up pipe makes for the most reliable setup. The other fix is to replace the cooler with a “performance” one that is not supposed to rupture. We do sell an 6.0 Powerstroke upgraded egr cooler and install them in applications that must have a functioning cooler. While it is a lifetime cooler it won’t solve all the egr issues. Even if the cooler will never pop with the better unit in there, you would still be getting exhaust gas into the intake system. If you have ever torn down a 6.0 Powerstroke, you would be amazed at the amount of soot that collects on the intake passages and intake valves. Letting dirty exhaust gas into the intake manifold is just a bad idea the whole way around. If you are on a tight budget, still under warranty, or worried about not having the cooler in there for emissions, you could just block the stock cooler off. The quickest and best low budget fix is to put a freeze plug in either end of the cooler and weld it solid. This way no exhaust gas can enter the cooler nor can any coolant exit if the cooler ever ruptured. You still have the dilemma of the scoop in the exhaust pipe, but this low buck fix will work ok if you can’t afford the delete kit to do it right. With this being said, I would still install the bypass kit on my own personal truck just to be rid of the whole mess for good. Also there is a good possibility if you weld up a blown cooler the coolant will fill the exhaust portion of the cooler up and break down the soot that is trapped in there. This soot will then circulate throughout your coolant system which you definitely don’t want. 4. Will deleting the cooler affect the way my truck runs? Will I get a check engine light? The answer to the first question is yes. You should see an increase in fuel mileage, a little quicker spool up of the turbo, and usually a little lower egt’s. There are no negative performance effects from removing the cooler no matter what your friendly Ford technician tells you. It seems like a waste of your money to install a high flow air filter or cold air intake system if you have hot, dirty exhaust gas pouring into the system just past it. As for the check engine light, you shouldn’t get one at all as long as you leave the egr valve in the manifold and plugged in on 03-04 trucks. On 05-07 trucks you will usually eventually get a check engine light from insufficient flow. They will need a programmer to disable the light like the SCT. Even on those trucks we do not recommend removing the valve. There is absolutely no reason to remove it from the system once you have removed the cooler. The computer can open and close it as many times as it wants. There is no feedback loop that lets the computer know whether or not the exhaust gas made it into the intake manifold when the valve is open. The computer will stay happy just opening and closing the valve at will. There are some delete kits out there that have a block off plate for the port where the egr valve goes. I don’t recommend installing them. For starters, there is no reason to block it off if you have the cooler deleted since no exhaust can get through the valve. Second, you will have to leave the valve plugged in and laying on the engine to stave off check engine lights which is kind of amateurish at best. Third, we have had issues with the clutch fan not operating properly for some reason if the valve is not plugged in. And lastly, most scanners will not do most diagnostics tests unless the valve is plugged in. 5. Is there anything I can do to prolong my egr cooler life if I want to leave it in? If you don’t want to remove your cooler for fear of black helicopters and jail time for tampering with Federal emissions devices, there are a couple of things you can do. First off, the lower you can keep your exhaust gas temperatures the better. Installing a high flow exhaust will help lower your egts considerably. A bigger more efficient intercooler like the Banks Technicooler or the Spearco upgrade will also help. Installing a turbo that moves more air like the Garrett Stage 1 will also help lower egts. And lastly, installing a pyrometer to keep an eye on exhaust gas temps will enable you to back out of the throttle when they get too high. Also making sure you run oil that has the right certification for your engine will help keep soot down a little. In conclusion, I firmly believe many of the horror stories of multiple blown head gaskets can be blamed on two egr cooler related things. First, a leaking egr cooler can cause the extremely high coolant pressures causing a head gasket issues. Secondly, many trucks get misdiagnosed as needing head gaskets because many mechanics don’t understand the engine. If you have smoke from your tail pipe that smells like coolant, your egr cooler is blown. The 6.0 head gaskets will almost never ever leak coolant into the cylinder like conventional gaskets. Likewise, blown head gaskets will not hydrolock a 6.0 engine either. It is coolant that ran out of the bad egr cooler and into the exhaust manifold then into an open exhaust valve. It is all too often we get trucks hauled in from different shops with these two symptoms expecting head gaskets and all we had to do was take care of the cooler.